In most cases, people come to the realizationthat they eat properly at the time when they begin a health problem or overweight. And often, both. With their problems often people come to the experts, read articles in magazines, watching. In general, any method is good if it leads to the correct result. Without food a person can not live - it is knowneverything. In ancient times, a person getting any food with great difficulty, and its value was unimaginable, but people treat food as the fact that only gives strength to continue to live and work, and did not build it into a cult. To eat, they could only natural products, mined his own hands. It was the best time and the best thingrelating to food. That is why in all the figures of the ancient world, we almost do not see fat people, people hardly obese or suffered illnesses related to unhealthy diet or overeating. On this basis, we can come to a simple conclusion that proper nutrition should be considered as those foods that give the nature or which are directly related to nature and the earth. Unfortunately, in our time - a time when allTV screens and billboards us look greasy burgers and pizza, sodas and sweets when the food does not need to produce extremely hard to restore people's proper attitude towards food in general, and to what they eat, in particular. In most cases, people come to the realizationthat they eat properly at the time when they begin a health problem or overweight. And often, both. Well, if the problem has not gone too far and did not lead to serious illnesses like diabetes, Gastric ulcer, etc. With their problems often people come to the professionals (nutritionists, gastroenterologists), read articles in magazines, watching and so on. D. In general, any method is good if it leads to the correct result. I emphasize, correct, t. To. Often people fall on scams that their health and beauty just want to earn. I'll try to talk about the basis of all bases infew words. There are three pillars: proteins, fats and carbohydrates. All products are composed of these, and each element is responsible for its part of our lives. Proteins - the building blocks of fats (the "right" and "not right") and carbohydrates (simple and complex) - the source of energy, but in its effect, they are very different from each other. All components work together and affect the absorption of each other. 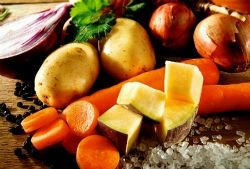 About each of the elements separately and can be a lot to tell, there are calorie foods, their glycemic index (Index impact on blood sugar levelperson) and much more, it is not necessary to study in great detail, but if you want there are many good books and sources of nutrition, you can get acquainted with this subject deeper. To get started, simply remember that limitingthemselves in the consumption of simple carbohydrates (sugar, bread, flour and pasta, fast food, carbonated soft drinks and juices and so on. d.) and reduced fat products (buy cheese, cottage cheese and milk are less fat, cook with olive oil or water) Standing in the way of achieving the goal - eat right. You also need to say a few words about thatthere should be frequent. 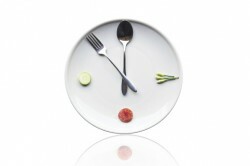 The intervals between meals should be 2.5-3 hours. This is to ensure that the body would be in the process of digestion was constantly running and accelerated metabolismSo that the body was not able to famine whenhe begins to store fat in reserve. And it is also important to remember that we are made up of 80 percent water, so need to drink a lot, more than I want to, because the state of thirst - it's bad, it's just the body's cry for help! Let's have talk with concrete examples that can and should be there, and from what is to abandon forever. We do, ideally - permanently exclude from the diet of sugar, pasta, white bread, soft drinks, alcohol, juices, sausage, hot dogs, chips, potatoes, pork and lamb fat, mayonnaise and sauces. Replace them with: natural sweetener - Stevia (sweet grass), if we can not drink tea and coffee savory, rice and buckwheat, whole wheat bread, water, low-fat cheese, fruit, berries and vegetables. We eat cheese, chicken breast, turkey, beef, seafood and fish with vegetables and complex carbohydrates as a garnish. 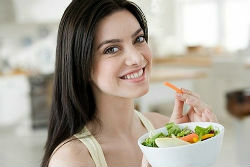 The basis of our diet becomes protein foods, complex carbohydrates and fiber. The food we preferably steamed (in a double boiler or multivarka). We try to use less oil and fry. Below is an example of the daily diet. Each portion should be calculated individually, considering total calorie per day! 5 meal about 2 hours before bedtime: low-fat cottage cheese, 200 grams. Throughout the day, in addition to tea and coffee, we drink plain still water in the total volume of 1.5-2 liters per day. You can also read the menu for this week. 1 meal: 50 grams of oatmeal with berries or fruit and a cup of coffee. 2 ingestion: a pair of small fruit or a bottle of low-fat yogurt. 3 meals: 100 grams of fish with 100 grams of rice. 4 meal: 100 grams of chicken breast with vegetables. 1 meal: sunny side of the 3 eggs and a cup of coffee. 4 meal: 100 grams of chicken breast with 100 grams of buckwheat. 5 meal: low-fat cottage cheese, 200 grams. 3 meals: 100 grams pilaf with squid. 1 meal: omelet of 3 eggs and a cup of coffee. 3 meals: Beef stew with vegetables, 100 grams. 4 meal: salad with vegetables and shrimp, 200 grams. A set of products is very large, how diverse is your diet depends on your imagination and culinary skills. 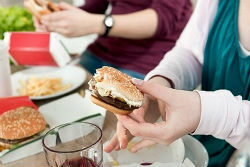 Believe me, your body quickly startsto say thank you for giving up junk food. You will feel easy, forget about digestive problems, and if you control and reduce the caloric content (by cutting back on portion sizes), then start the process of losing weight. By adding to the nutrition an active lifestyle and exercise, you will gradually move to a perfect figure and fine health. The main thing to remember, you are doing all of this for you favorite!